This design is free from the Red Heart website. 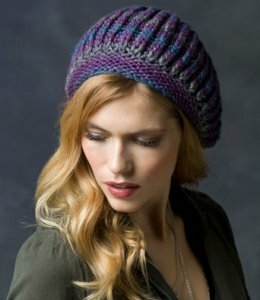 : "This easy rib knit beret actually has the look of the more complicated Brioche stitch. Color changes happen automatically while knitting with this elegant yarn that has a dash of metallic for a bit of glam." Size US 9-16" circs and US 9 DPNs (or size needed to obtain gauge) are required but not included. Finished Measurements: One Size Fits Most. Finished Gauge: 14 sts over 4". Color Shown is #1933 Aura.